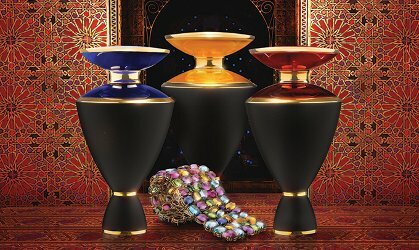 Bvlgari has added three new fragrances to their luxury Le Gemme collection. Lazulia, Zahira and Selima were developed by perfumer Daniela Andrier. Lazulia ~ Woody oriental. "Lazulia takes you on a night journey through the fabulous, sensual tales of the Arabian Nights. A gem of royalty and spirituality that has symbolized the celestial since time immemorial, the lapis lazuli is symbol of life force and a source of power. Lazulia, meaning “deep blue” in Arabic, is a mysterious and heavenly hypnotic oriental woody Eau de Parfum of brilliant azure blue. This atmospheric fragrance, moody and nocturnal, opens with a jasmine starlight and slowly modulates into a mysterious natural incense. It lingers, diffusing into royal oud wood essence." Zahira ~ Floriental. "Zahira drives you through a journey across the hot golden deserts of Arabia. It evokes the intense glow of the imperial topaz, a bright gem that radiates energy, bestows confidence and charisma, inspires admiration and respect. Zahira, meaning “shining and luminous” in Arabic, is a radiant and fiery oriental floral Eau de Parfum that diffuses the glowing warmth of the desert. This golden fragrance opens powerfully with the fiery spice heat of royal cinnamon, to then unfurl into a heady, swirling heart of radiant ylang-ylang, a lively flower with rich tones as vibrant and luminous as the rays of the sun, sustained by voluptuous benzoin resinoid, bright and rich." Selima ~ Spicy oriental. "Selima invites you on a journey through the rich world of the Arabian peninsula. It is inspired by the carnelian, a sacred gemstone symbol of serenity and abundance, life & wealth, which replaces negative with a love of life. Selima, an evocative Arabic name meaning “serene and calm”, is a soothing, incandescent oriental spicy Eau de Parfum of luscious red energy. At the centre of this deliciously rich and addictive fragrance is saffron, veiled rose of the Orient, made intensely gourmand by the embrace of date delight and a profusion of alluring spicy top notes." Bvlgari Lazulia, Zahira and Selima can be found now at Harrods in the UK, £231 each for 100 ml Eau de Parfum. Those bottles are incredibly beautiful and the price is redonkulous, just like the last batch. That Selima sounds awfully good, mind you: it’s got “me” written all over it. But not at those prices. I have still not tried (or laid eyes on) any of these…and from what I’ve read, they’re pleasant but not worth the money.